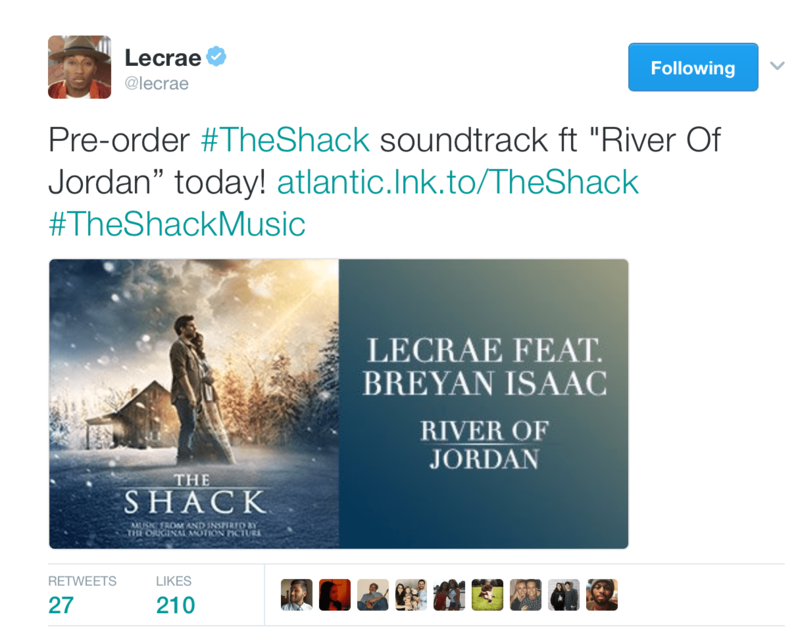 Lecrae Endorses The Shack, Calls The Movie "Dope"
Lecrae, a popular Christian rapper, has taken to Twitter to promote The Shack. Lecrae’s song “River of Jordan” (featuring Breyan Isaac) will be played during the movie. Other than Lecrae and Isaac, the rock bands NEEDTOBREATH, for KING & COUNTRY, We Are Messengers, and Skillet, the Prosperity Gopsel band Hillsong UNITED, and Contemporary Christian singers Francesa Battistelli and Lauren Daigle will be contributing to the movie’s soundtrack, as well as many professed Christians who sing country music, including Tim McGraw and Faith Hill (Source). Lecrae took to Twitter to promote this soundtrack. 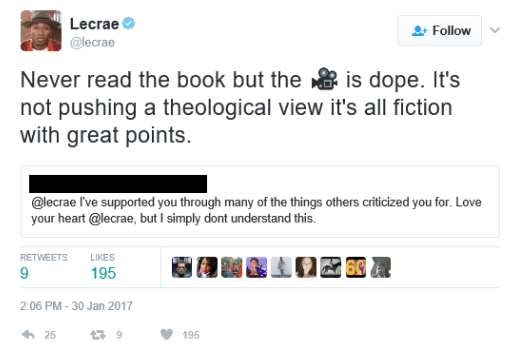 When a fan pointed out that he shouldn’t have done this, Lecrae responded by calling the movie “dope” and saying it has “great points”. He claimed it wasn’t “pushing a theological view”. Contrarily, The Shack does have theological views. All things that refer to God are theological in nature, and Tim Challies notes what appears to be the heresy of Modalism appearing in the book, “Overall, I had to conclude that Young has an inadequate and often-unbiblical understanding of the Trinity. While granting that the Trinity is a very difficult topic to understand and one that we cannot know fully, there are several indications that he often blurs the distinct persons of the Trinity along with their roles and their unique attributes. Combined with his novel but unsupported conjectures, this is a serious concern…” (Source). 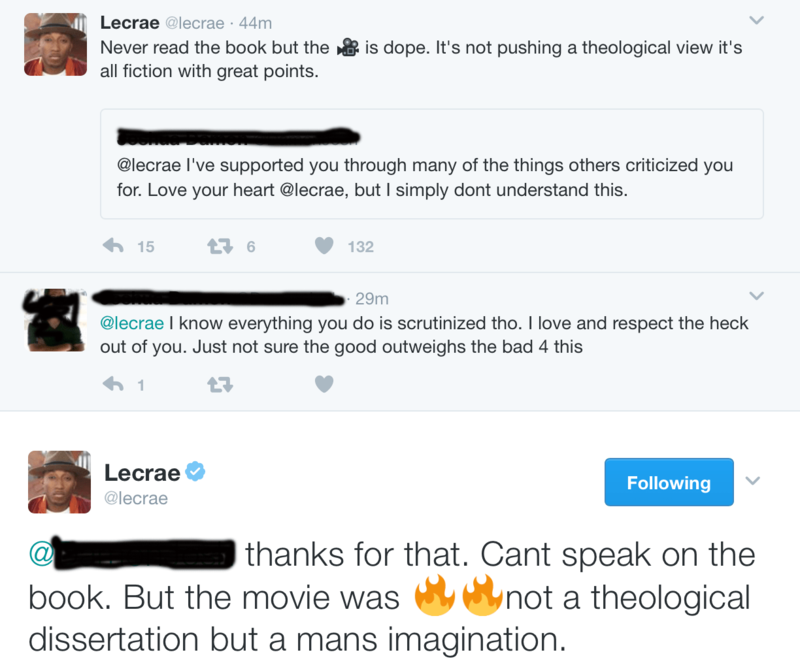 When further questioned on this, Lecrae continued to Tweet his support for the movie. If the movie is anything like the book, the Father and Holy Spirit were portrayed as women with human bodies and the Godhead was portrayed as Modalistic, and these are heretical lessons that should not be promoted, but avoided. *Update: Lecrae has since removed these Tweets from his Twitter page. However, he has not yet publicly repented and apologized nor has he denounced the movie. As of now, his music will still be in the soundtrack.